This article will discuss how advanced water technologies can be used to optimize water usage. It is one of a five part Water Tap series including Water Analytics, Water Recycling, Desalination, Advanced Water Technologies, and The U.S. and Singapore Water Tap Comparison. Advanced water technologies provide a partial solution to the growing, worldwide water shortage. Indeed, the problem is a large one. 700 million people worldwide suffer from water scarcity and that number is expected to swell to 1.8 billion within the next decade. Innovative countries such as Singapore, Israel, and Japan utilize advanced water technologies such as desalination, smart meters, analytics, and water recycling to meet the growing demand for fresh water. In the United States, the need for clean, fresh water is growing by the day. According to the University of California, Davis, the drought inflicted $1.5 billion in agricultural losses in 2014 alone. Meanwhile, technology platforms are in place to drive widespread innovation throughout the industry. 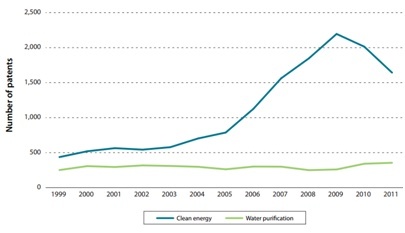 The time is ripe for advanced water technologies to bridge the gap between supply and demand issues. So far, the technology industry has suffered from underinvestment and a lack of scalable technology. Looking forward, innovative technology in the industry is expected to become more prevalent. Federal and state R&D tax credits are available to support the commercialization of advanced water technologies and potentially solve the growing worldwide crisis. Source: Organization for Economic Co-operation and Development, 2014. As recognition of the worldwide water shortage issue emerges, advanced water technology development is expected to pick up steam. The mainstream advanced water technologies include desalination, recycled water, and water analytics. These topics are discussed in turn throughout the five part series. Some other, less traditional, innovative technologies being developed by innovators around the world are discussed below. American Water - Voorhees, NJ – American Water provides smart meters, acoustic supply pipeline monitoring, and other water infrastructure technologies and services. American Water spent $1.9 million on research and development in 2013. Cambrian Innovation - Boston, MA - Cambrian Innovation is a biotech company that has created a bioelectric process to treat wastewater while generating additional energy via biogas. Cambrian's EcoVolt bioelectric units are portable and remotely monitored and controlled and are the size of cargo containers. They generate clean electricity and heat directly from industrial wastewater streams at about 30-200kW. Some of Cambrian Innovation's research was developed with support from the National Science Foundation and the National Aeronautics and Space Administration (NASA). Dutch Rainmaker - Netherlands - Dutch Rainmaker creates windmills that use only wind to create mechanical energy to compress moist air into water. The efficient process is passive and requires almost no maintenance. Two prototypes have been running for the past two years in the Netherlands and Kuwait producing an average of 7,000 liters of water per day. Dutch Rainmaker wants to drive growth of this technology to create sustainable, zero chemical, or energy consumption water production with minimal operating cost. Dutch Rainmaker is currently launching new applications of their technology to clean and recycle water. California is America's largest state by population and confronts a dire water shortage problem. It is no surprise that agriculture is a major consumer of water and advancements in smart agriculture hope to manage, control, and optimize water usage in agriculture. The same technologies can be used in industrial applications. UCLA's Water Technology Research Center's (WaTeR) mission is to advance technologies of water production in order to develop new and practical sources of water for different uses. WaTeR's projects and research focus on sustainable water production, water treatment, and water recycling. WaTeR also provides services such as analysis, diagnostics, and evaluations for water desalination and purification processes. Columbia University's Earth Institute hosts the Columbia Water Center - a research center that was establish to tackle the water challenges of a rapidly changing world. The Columbia Water Center collaborates with the other Earth Institute entities and strategic partners to conduct scientific and intellectual inquiries into assessment, understanding and resolution of global water challenges. Columbia Water Center examines water and climate needs and challenges from multiple angles, integrating the needs of food and energy production into their efforts. "Among the main management and policy barriers are (1) unrealistically low water pricing rates; (2) unnecessary regulatory restrictions; (3) the absence of regulatory incentives; (4) lack of access to capital and funding; (5) concerns about public health and possible risks associated with adopting new technologies with limited records; (6) the geographical and functional fragmentation of the industry; and (7) the long life expectancy, size, and complexity of most water systems." Stanford University recently opened the Codiga Resource Recovery Center at Stanford - a collaborative effort between the university, its partners, and affiliates to accelerate commercial development of new wastewater technologies. The center hopes to develop and help bring to market wastewater technologies that can be used to create useful water supplies from captured and treated wastewater. Temple University’s Water and Environmental Technology (WET) Center aims to develop water quality and treatment technologies. Temple's WET center has obtained grants from the National Science Foundation (NSF) in the form of a $1 million Accelerating Innovation Research grant, which aims to bring innovations from Temple's WET center to the marketplace. This $1 million grant was matched by the Pennsylvania Department of Community and Economic Development with an additional $350,000 coming from the WET Center’s industrial partners. The NSF grant is particularly important because it marks a recent trend in the NSF - providing grants to not only conduct R&D but also bring innovations to the marketplace. The Colorado Water and Energy Research Center (CWERC) was launched in 2011 to provide the public with an research center focused on water resource and sustainability issues and to enable citizen science projects on relevant topics. They also conduct sample analysis, field studies, and modeling of sites all over the world. The University of Arizona's Water Resources Research Center (WRRC) was established in 1957 to promote understanding of state and regional water management and policy issues through scientific research. WRRC promotes education and awareness of water conservation and management. It is a member of the National Institutes for Water Resources and a member of several regional water education and policy programs. The WRRC's funding amounted to $1.95 million in 2013, mostly gained through private grants and state appropriations. The worldwide water shortage is a large one. Looking forward, innovative technologies will provide a partial solution to problem. The biggest challenge for both researchers and businesses trying to bring innovations to market lay in funding their projects. Making use of both federal and state R&D tax credits can help innovations come to market and address the water shortages the United States faces both now and in the future.